Hammer’s war films (cf. “The Steel Bayonet”, “The Camp on Blood Island”) tended to examine the more controversial aspects of warfare and in this film the unpopular idea is suggested that the British were just as capable of committing atrocities as anyone else! Actor Guy Rolfe also worked for Hammer in “The Stranglers of Bombay” (1959). For outrageous director William Castle, he starred in “Mr Sardonicus” (1961). Interestingly, this film is probably the only Hammer production to have no musical accompaniment whatsoever. 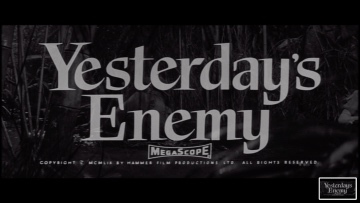 (1967’s “The Anniversary”, whilst having none during the action, does have music to accompany the opening and closing titles).